Is it possible that too much iron in infant formula may potentially increase risk for neurodegenerative diseases like Parkinson's in adulthood -- and are teeth the window into the past that can help us tell? This and related theories were described in a "Perspectives" article authored by researchers from the Icahn School of Medicine at Mount Sinai and the University of Technology Sydney and Florey Institute of Neuroscience and Mental Health in Australia, and published online recently in Nature Reviews Neurology. "Teeth are of particular interest to us for the measurement of chemical exposure in fetal and childhood development: they provide a chronological record of exposure from their microchemical composition in relation to defined growth lines, much like the rings in a tree trunk," said Manish Arora, BDS, MPH, PhD, Director of Exposure Biology at the Senator Frank Lautenberg Environmental Health Sciences Laboratory at Mount Sinai and Associate Professor in Preventive Medicine and Dentistry at the Icahn School of Medicine. "Our analysis of iron deposits in teeth as a method for retrospective determination of exposure is just one application: we believe teeth have the potential to help track the impact of pollution on health globally." Dr. Arora, along with Dominic Hare, PhD, used the dental biomarker technology to distinguish breast-fed babies from formula fed babies. Now this technology can be applied to study the link between early iron exposure and late-life brain diseases like Parkinson's and Alzheimer's, which are associated with the abnormal processing of iron. While not all formula fed babies will experience neurodegeneration in adulthood, the combination of increased iron intake during infancy with a predisposition to impaired metal metabolism such as the inability of brain cells to remove excessive metals may damage those cells over time. Dr. Hare, a Chancellor's Research Fellow in the Elemental Bio-imaging Facility at the University of Technology Sydney, says "Only now do we have the technology available to use to look back in time at someone's diet as a child, more than 60 years after they stopped wearing diapers. State-of-the-art imaging technology is a chemical time machine that can tell us about decades-old chemical exposures that are equivalent to a drop of ink in a swimming pool." In the case of baby formula, the need to better understand human iron metabolism has become more urgent with the global popularity of formula and fortified cereals. Adding iron to formula has been an industry standard for decades, in part because about two billion people worldwide - mostly in developing nations - are thought to have chronic anemia and iron deficiency. Evidence, however, that children in the United States or Europe, for instance, get too little iron is insufficient, according to the authors, and the reported developmental and nutritional benefits of iron are modest. The European Society for Paediatric Gastroenterology, Hepatology, and Nutrition have since stated that there's no evidence that babies of normal birthweight need iron supplementation, yet in the U.S. it's still commonplace. Dr. Hare continues: "While it might seem like drawing a long bow linking what happens in childhood to diseases we think of as associated with growing old, the increasing rates of these diseases mean we need to do everything we can to find out what might play a role in how the disease starts. Knowing this gives us something to target when designing new treatments." Beyond the wide-reaching hypothesis that iron supplementation may increase risk of neurodegeneration, the authors think a priority in pediatric research should be the rigorous determination of iron supplementation needs of infants according to their individual iron status. Formula manufacturers have a responsibility to replicate the chemical composition of breast milk, particularly with regard to iron content. The current ‘one size fits all' approach to iron supplementation may be both clinically unnecessary and introduce an unacceptable risk later in life. Whether this hypothesis proves to be true or not, it calls into question decades of treatment dogma that deserves to be revisited with the most cutting-edge technology available. The Mount Sinai Health System is an integrated health system committed to providing distinguished care, conducting transformative research, and advancing biomedical education. Structured around seven hospital campuses and a single medical school, the Health System has an extensive ambulatory network and a range of inpatient and outpatient services-from community-based facilities to tertiary and quaternary care. 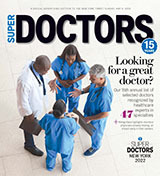 The System includes approximately 6,100 primary and specialty care physicians; 12 minority-owned free-standing ambulatory surgery centers; more than 140 ambulatory practices throughout the five boroughs of New York City, Westchester, Long Island, and Florida; and 31 affiliated community health centers. Physicians are affiliated with the renowned Icahn School of Medicine at Mount Sinai, which is ranked among the highest in the nation in National Institutes of Health funding per investigator. The Mount Sinai Hospital is nationally ranked as one of the top 25 hospitals in 8 specialties in the 2014-2015 "Best Hospitals" issue of U.S. News & World Report. Mount Sinai's Kravis Children's Hospital also is ranked in seven out of ten pediatric specialties by U.S. News & World Report. The New York Eye and Ear Infirmary of Mount Sinai is ranked nationally, while Mount Sinai Beth Israel, Mount Sinai St. Luke's, and Mount Sinai Roosevelt are ranked regionally.